If you’ve not yet read the article, “4 Areas of Leadership in Christ“, it might be helpful to start there, because godly counseling supports godly leadership. How? Leadership in Christ helps others continue following Him. Counseling helps those who are stuck or wayward. As I’ve said in previously, leadership in Christ is simply equipping and encouraging others to follow us as we follow the Lord (1 Corinthians 1:10-17, 4:16, and 11:1, 2 Thessalonians 3:7-9, Hebrews 13:7, 3 John verse 11, etc.). After God’s command to fill the world with His image (the call to discipleship), His very next command was to lead (Genesis 1:28). But He had first told them to fill the world because we can’t lead alone. Why? God is the essence of relationship as Father, Son, and Spirit, so we can only live in His image by being in relationship, too. There should never be a Lone Ranger leader in the Body of Christ. But even when we work together, leadership rarely goes smoothly. So why am I spending so much time on leadership in an article about counseling? We need to see why and how counseling is to be leadership’s right hand of support. All of God’s Word, shows us that life here is hard: filled with misunderstandings and fighting among His people, ungodly relationships with unbelievers, personal temptations, sins of self-righteous anger, faithless fears and depressions, and deep waters within a person’s own soul that even they can’t understand. Therefore, God also calls us to counsel: helping the stuck or wayward to get back on track to following Christ. In fact, that’s exactly what we see the Lord doing as soon as Adam and Eve decide to follow their own paths for independence from God. We’ll look at that more closely in a moment. And if you think counseling can be a complex process that is simultaneously deep, broad, and detailed, you’re right. So a few memorable summaries may clarify some basics. Think of counseling in Christ as four areas of love: we are to discern, learn, broach, and coach. Discerning is similar to the first duty on leadership: anticipation (described in a previous article). Leaders in Christ understand that our Lord calls all of us to love, but they also know that this world is fallen in sin. So leaders look ahead or “anticipate” problems coming to their people so they can prepare them to love as well as possible. Discerning, on the other hand, is seeing the problems that have already come upon a person. But it’s not merely recognizing symptoms. It’s dealing with deeper heart issues. Therefore, godly discernment comes by understanding key themes of the gospel and common ways it plays out when His commands, promises, or character is neglected, distorted, abused, etc., especially in relationships where there is a properly high expectation of leadership (e.g., Adam’s role) or support (e.g., Eve’s role). We cannot begin to move toward an effective solution until we’ve discerned the specific problem. We don’t have to understand everything in the Bible or everything about the person, just the core struggle of the person’s heart as that relates to basics in God’s Word. Thus, parents, supervisors, coaches, mentors, etc., must regularly feed on God’s Word and listen to others who love the Lord Jesus. Which leads us to the second area. Learning implies that we truly listen to the person who is struggling. As wise as we may be, only the person in need of counseling is the expert in their own pain. Discerning is about the broad strokes of basic truths from God’s Word and how they generally manifest when a person has sinned (or been the victim of others’ sins) in specific ways. Learning, however, is about what only the hurting person can tell us: the details of their suffering, their specific perceptions, exactly what they’re valuing, why and how they’ve been in relationship with others who are part of their concern – rightly or wrongly, in truth or not. Again, we must first identify the problem, even if we think their view is completely incorrect, unjustified, foolish, and easily fixed. Godly counselors weep with those who weep, simply because the hurting person is in God’s image, just like us. If we are merely theologically or intellectually discerning, we can easily treat the wayward and stuck as less than human, a project of personal challenge for our knowledge and skills. Learning from them will require us to be okay with not knowing, talking less, asking open-ended questions and not interrupting, recognizing apparent rabbit trails as possible glimpses of their real concern, and being patient with the person who seeks safety in opening their heart in a passing comment 5 minutes before the end of your time together. Learning the details of the other person’s pain is a key part of loving. It’s also essential to them trusting and responding to us toward solutions. Isn’t that exactly what the Lord did when He asked Adam and Eve, “Where are you?” (Genesis 3:9) and “Who told you that you were naked? Have you eaten of the tree of which I commanded you not to eat?” (Genesis 3:11) and “What is this that you have done?” (Genesis 3:13) or when the bleeding woman touched Jesus who then asked “Who touched me?” (Luke 8:43-48)? Didn’t He know? Of course, He did. But in His case, He was helping them learn about themselves, and specifically by the third part of counseling: broaching the tough topics. Broaching means helping the hurting person go where they don’t initially want to go: the deeper heart-concerns they’re guarding consciously or unconsciously. Not all questions in counseling should be painfully penetrating. But as far as I can tell, every time the Lord Jesus asked a question He was pressing someone to look deeper into their own heart. And a person’s resistance – blatant or subtle – often points precisely to where we need to go. Their silent walls, diversions, and open pushback are like the vault doors of a bank: they’re sure signs that some of their most valued treasures are on the other side. As you probably suspect, breaching is the most difficult part of counseling. But it’s also the most trasnsformational. If we neglect or avoid it, we can be superficial conversationalists at worst and detached teachers at best. Of course, conversation and teaching have their places, but let’s go back to the bank analogy. When Jesus was spreading about spiritual problems, He said “But no one can enter a strong man’s house and plunder his goods, unless he first binds the strong man. Then indeed he may plunder his house.” (Mark 3:27) So broaching may lovingly invite trouble, but it’s necessarily to go deeper to the heart. It may mean noticing the other person’s eyes roll or water and inviting them to say what’s on their mind. But what? To help them bring those tensions out into the open, maybe for the first time ever. It may mean hearing two people say they’re doing fine, but we state that they seem to be sitting atypically far from each other. It may mean taking them back to something they tried to dismiss a few minutes before. It definitely means not being content to deal with symptoms. No cancer was ever cured by pain killers. Also like medical help, good counseling is to be as temporary as possible. Which leads us to the last area. Coaching is the counselor’s duty, too, but a bittersweet one. It’s helping them leave. To use a different analogy, leading is like owning a sports team. It’s a binding relationship for the leader’s goals. In Christ, those goals are to love God and our neighbor as He has revealed. Counseling is more like coaching an athlete. It’s a temporary help to prepare the individual to the point that they no longer need us. Counselors should seek to work themselves out of a job. A leader’s job is never done. Coaching by counselors (like training by leaders) teaches knowledge and insights, trains the person in skills, helps them rehearse or role-play what they’ve learned, prepares them for contingencies, reviews the basics, and always avails ourselves to new needs that may arise. But again, unlike leaders’ training, counselors’ coaching works toward ending the relationship. Any Christian relationship designed to help a person to grow beyond their coaching yet holds onto them is failing to love and fails to prepare the other person to love. As you might imagine, relationships may entail leadership and counseling. For example, parents are elders in their walk with Christ. Thus, they are to lead even their adult children by guidance, encouragement, modeling, etc. But as mere stewards of those same children who truly belong only to God, they are also to “counsel” them toward leaving home successfully for their own walk with the Lord. But I digress a bit. Like leadership, counseling is not always glorious, either. The most godly of counselors in Scripture met resistance to their insights, exhortations, and enouragements. As mere humans, they, too, experienced situational set-backs, personal failures, and other hardships. But godly counselors also recognize that Christ is our wonderful Counselor (Isaiah 9:6). So we bring our deepest pains to Him and hear whatever His Word and Spirit say to our souls as true wisdom. This is exactly what we see Solomon wanting when the Lord commended him (1 Kings 3:7-14). Arguably, he was the greatest counselor in the Old Testament, being hailed as the wisest man who ever lived. That being said, you may find it helpful to read devotional thoughts on the 12 times the book of Proverbs refers to a “person of understanding” in the series similarly named, Counseling as a Person of Understanding. And because counseling in Christ can be challenging. Therefore, this website also provides you with tools for the trenches to help the wayward or stuck to get back on track: devotional thoughts for those reading through the Bible in a year, Scriptures and related Christian music videos that teach and encourage, articles on current events from a Christian perspective, how to use physical exercise for small group Bible study and Christian fellowship, deeper theological studies such as 8 “P”s of the Gospel from Genesis 1 to Revelation 22, studies on “fruit” to be the fruit of God’s image and bear fruit, training videos and articles on Christian leadership and counseling, teaching videos on understanding and apply the Bible, reviews of Christian books and movies, and much more. I hope you find them helpful to your counseling, wherever the Lord has placed you to follow Him by faith for joy in Christ. As God provides over time, I will provide more and more tools for your trenches. To find posts within each of the seven series, go to menu above. For your convenience, toward the end of each of the category/tab and individual post I also provide links to related posts in the same series. 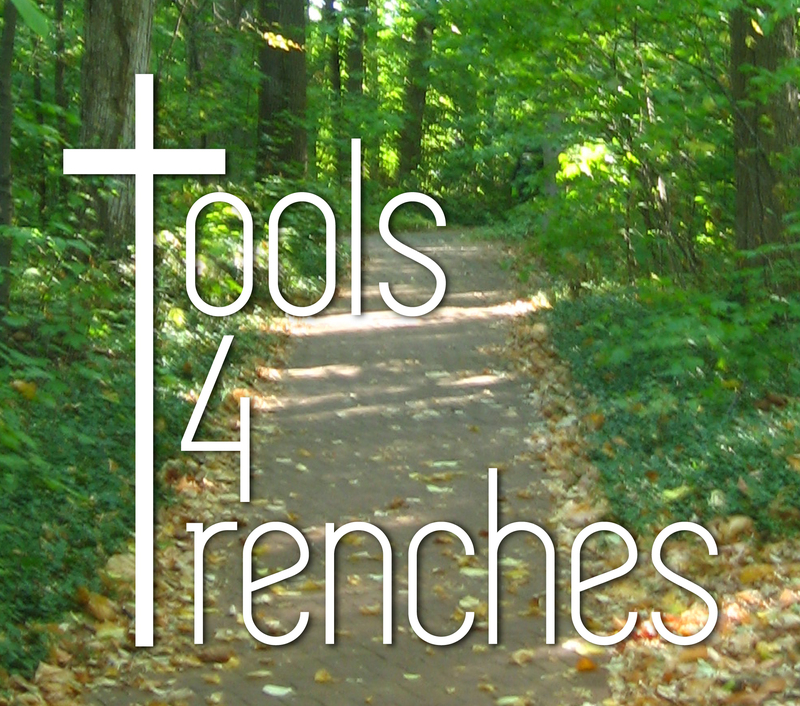 This entry was posted in tools4trenches. Bookmark the permalink.